Miles Scotson became a Junior Track World Champion in the team pursuit in 2012. Then claimed his first senior World title in 2014 in the team pursuit in Cali with Alex Edmondson, Glenn O’Shea, Luke Davison and Mitchell Mulhern. While Scotson has spent some of the past two years with the Jayco-AIS World Tour Academy including finishing third in the prologue at Royal Smilde Olympia's Tour. The majority of Scotson’s success has been on the track. After finishing third in the time trial last year just 14 seconds off the win Scotson was ready for revenge in 2015. On a wet and rainy day Scotson stormed to his first major success on the road taking the under 23 national time trial title by four seconds over Oscar Stevenson. With the time trial under his belt Scotson’s focus turned to the road race with his strong SASI squad. When Scotson bridged to the break and then attacked the field made the mistake of giving him some ground. That mistake was to Scotson’s advantage, as he was not seen again. In winning the road race Scotson became only the fourth rider to do the double, joining a club that includes Jack Bobridge, a rider he has long looked up to. Next on the agenda is the Tour Down Under with the UniSA squad. Then it is back on the boards for the Track National Championships and targeting a spot in the team to defend his team pursuit title in Paris in February. For now Scotson will continue to combine the track and road. One thing is sure however that the story of Miles Scotson is only just starting. Below Scotson talks the ups and downs of 2014, his under 23 time trial and road race double and upcoming track goals. PelotonWatch: What was it like being named in your first Australian team for an elite World Championships at the start of 2014? Miles Scotson: That was a great feeling and big relief for me, the year before in 2013 I was straight out of the under 19 ranks and during my first training camp with the senior team pursuit squad I was going strong and was invited to the World Track Championships camp and not sent to the World Cups. I thought that was great until I was sent home half way through the camp and did a season without representing Australia internationally. On the same camp a year later I was really determined to make the team and it was a big relief when I was told I had been selected. PW: Part of the winning team pursuit squad in 2014. How did it feel to pull on the rainbow jersey? MS: It definitely has to be one of my happiest moments, I only rode the qualifying but I didn't care. I was aware that we were going to be using five of us for the team pursuit and watching that final I was really nervous. I have to say it was close to the most excited I’ve been watching the guys win and knowing I was a senior World Champion. PW: A former Junior World Champion in the team pursuit how did winning an elite title compare to your junior success? MS: Winning a Junior World title was really exciting at the time but I really see Junior Worlds as a stepping stone to the elite. After winning the Junior Worlds I’m really glad I never got complacent and could make a good step up to the seniors because winning the senior World title and being able to race World Cups last year with the rainbow bands really outweighs my junior success. PW: Named in the Australian team for the Commonwealth Games what was the experience like? MS: The moment I found out I was selected for Commonwealth Games to the moment of having to withdraw during the points score at the Games were total different ends of the stick in terms of how I felt. When I was told I was selected for the Commonwealth Games I was so excited and really motivated. The experience of being there at the village with all the athletes was awesome. I also really enjoyed the first part of our camp training in America, they are all periods I’ll never forget. However after having a strong couple of months in Europe on the road and then going into a six week camp I really think I just ran out of stream leading up to the Games to put it simply. After missing out on the team pursuit and a really disappointing ride for myself in the points score, it was devastating for me and the whole excitement of being there at the Commonwealth Games really disappeared that night. Although it was great to represent Australia when I think back to the Commonwealth Games I just remember how disappointed I was and it still motivates me. PW: You competed at Omnium Nationals at the end of December and with Road Nationals just over two weeks later how do you manage the quick turnaround between track and road? MS: This summer I spent a lot more time doing road training and I basically trained through the Omnium Nationals as I didn't do I big taper for it or anything like that. I basically jumped back on the track bike for a couple of sessions in the week leading up to the omnium but the rest was spent training for Road Nationals. To still have a good Omnium Nationals was positive and that was the moment I knew I was coming into some good condition for the National Road Championships. 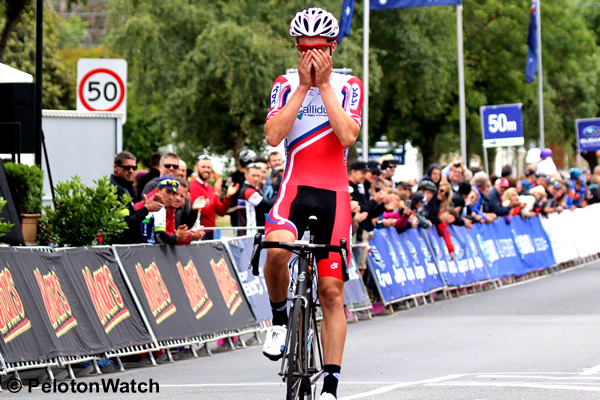 PW: What were your expectations heading in to Road Nationals? MS: I wanted to win the time trial and I knew I was a good chance because I had put a lot more work in than the year before when I was third. For the road race I also wanted to back the time trial up with a solid result hoping to finish with at least a top five. PW: You claimed gold in the time trial. Your first major win on the road what does it mean to you? MS: The time trial win was great because I’ve always been solid in time trials but I’d never won a big one. It was also a bit of relief as a lot of people supported me for it so I was glad I could finish it off and get the win. PW: You were in the break in the road race, before attacking and eventually taking a solo victory. What was going through your mind as you crossed the line? MS: That moment was almost emotional for me, to be there on the start line before the race visualising crossing the line first after Tim Decker spoke to me before the start. To do it solo exactly like we had visualised was just overwhelming. I think that moment really has to be the highest of my career and it makes all the hard work worth it. PW: Before the road race did you have any thoughts that doing the double might be possible? MS: I knew I had really good form but I knew if I was going to win I had to do it by either an early or late breakaway. Obviously winning the time trial made me a bit more marked but when I decided to go across to the break on the climb about three or four laps in and some of the over favourites hadn't responded I knew that it was a chance to try and win the race and I committed to the plan. I knew I had the form to win if I got away solo, I just didn't think it would happen. PW: You have joined a select group of riders to do the double in the time trial and road race. How does it feel being compared to the likes of Rohan Dennis and Jack Bobridge? MS: That's pretty much what inspired me and especially coming up through the junior ranks I’ve always looked up to Jack Bobridge and to do the double like they did gives me confidence that I'm making the right progression to get to a high level of the sport. PW: Named in the UniSA team for the Tour Down Under. What are you most looking forward to about the opportunity? MS: It’s really special for me because being in my home state I’ve followed the Tour Down Under nearly every year since I was about three years old with my family. The race has always excited me so to do it with my family and friends watching is going to be a really cool. From the racing side of view I really want to take the opportunity to learn as much as I can to make it a positive experience for my road career and I’m also hoping I come out of it really strong as preparation for the Track World Championships in February. PW: Then it is back to the boards for Track Nationals at the end of January. What are you aiming to achieve there? MS: Because the track nationals are only three days after the Tour Down Under I’m probably going to have to skip the individual pursuit which is kind of annoying because I think I could have had a good ride this year. However I really want to do a good team pursuit there and use it as a rehearsal for the World Championships where I’m hoping to ride the team pursuit again. Miles Scotson cannot believe it as he crosses the line to do the under 23 double.